There are several reasons as to why there may be a build up of condensation and excess moisture in your home. There are also several solutions to the problem at hand and a few simple changes you can make in order to prevent this occurrence. The accumulation of condensation can cause window frames to rot and wallpaper to peel if it is not treated adequately. Black mould can also start to develop near windows, in the corners or rooms and on soft furniture. Mould is especially susceptible to developing in the winter months and on the North facing walls that lack sunshine. Here is a guide to condensation removal and how you can achieve this at home. There are several ways condensation and mould is caused in your home. 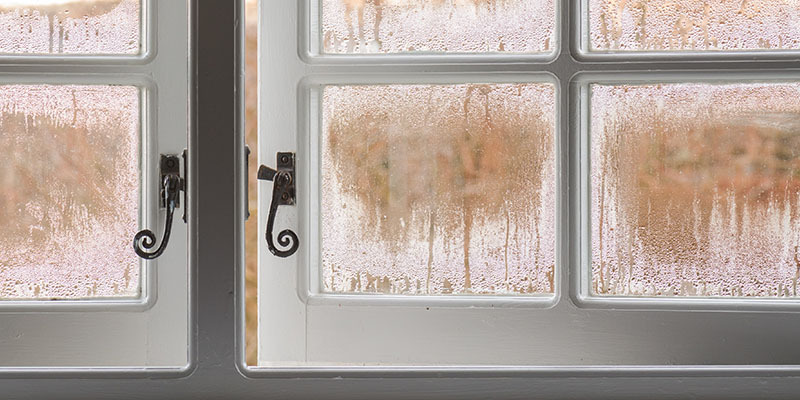 Dampness is produced by the buildup of condensation which occurs when moist air and cold surfaces, such as windows or walls, come into contact with each other. A buildup of tiny water droplets is created and then results in the growth of black mould. Steam produced in the home causes condensation. This can be from cooking, boiling kettles, showering, bathing or drying laundry. When there is not enough ventilation in the property damp air cannot escape, and condensation is formed. Another reason for condensation forming is when there is not enough heat in your home, and water vapour comes into contact with the cold surfaces. The water vapour then condenses, and dampness is formed. Having poorly insulated walls and ceilings will also contribute to the amount of condensation forming in your home. When the building can’t retain its heat, and the surfaces become cool, there is a buildup in dampness and condensation. Keep reading to find out how to minimise the amount of condensation developing in your home. Leaving wet clothes to dry in various rooms around your home will increase the amount of moisture in the air and contribute to the buildup of condensation. Instead of airing your clothes in the house, dry them outside on the washing line to prevent excess moisture from forming in your home. If you are unable to dry your washing outside, then hanging them out to dry in the bathroom with the door shut and the windows open is an alternative. This will allow the moisture to escape through the window rather than circulating around your home. If you have a tumble dryer, then make sure to vent it to the outside through an open window or an outside wall. Ensure that your washing machine is also vented correctly. 2 litres of water is emitted into the air from just one load of washing, so it is essential to have an effective vent installed correctly. When you are cooking, try to ensure that lids are covering pans at all times. This is to help reduce the amount of moisture created from boiling water. If you have one installed, make sure to always use your extractor fan or extractor hood above the cooker, which is designed to minimise the amount of moisture created when cooking. Remember to also leave it on for a good 10-15 minutes once you have finished cooking. The moisture is likely to still be in the air even after you have finished so do not turn it off too soon. It is a good idea to also keep internal doors closed when you’re cooking and steam is produced, to prevent the moisture from spreading further. If you do not have an extractor fan, it is a good idea to purchase one if you are struggling with condensation and dampness problems in your home. These devices have humidity sensors which will work more effectively when you are producing steam and then slows down when the humidity levels have dropped. You can have these installed onto either ceilings or walls in your property’s kitchen. You can also opt for eco-friendly fans to lower your energy bills and help protect the environment. Although it is essential to keep your home well heated in order to prevent the build-up of condensation, avoid using paraffin heaters which produce a lot of moisture. This method of heating is not only a massive safety hazard to you and your family, but this form of heat tends to create an excess of condensation inside your property. Keep all of your room temperatures at a minimum of 15 degrees Celsius and invest in effective wall and ceiling insulation. It is essential to keep room temperature levels consistent and try not to let them fluctuate excessively. Having a thermostat can be useful for monitoring temperature levels and making sure they are constant. During the winter months, it is a good idea to leave the heating on all day in order to sustain an even temperature. Even in the rooms that you don’t often use, make sure the heating is still set in order to avoid cold areas. It is better to keep all of your rooms set to a cooler, consistent temperature. You can also avoid damp entering your home through the effective installation of wall, loft and ceiling insulation. Through draught proofing your doors and sealing gaps in your windows, you can effectively minimise draughts. Not only will this save you money on your energy bills, but it will further help to reduce the buildup of condensation in your home. Installing double glazed windows into your home will help to prevent heat escaping. We can provide windows in Milton Keynes for an affordable price and a quality finish. Effectively ventilating your home is another crucial way to avoid excess moisture, dampness and condensation. Most modern windows are now fitted with trickle vents. Make sure you leave these open or keep windows open slightly to improve ventilation. Breathing is a primary cause of excess moisture in the air, so it is essential to leave your trickle vents open in the rooms you use most. Dehumidifiers are an effective way of filtering out the moisture in the air and increasing ventilation in your home. However, this is only a temporary solution to the problem and cannot be left running for long periods of time. Here are some effective ways that you can help to reduce the moisture levels in your home and the accumulation of condensation and dampness. We also suggest, as a few last top tips, to ensure there are gaps between your walls and soft furniture, and that your wardrobes are not over-full. Condensation can build up in clothing closets and wardrobes when they are too full and the air cannot circulate effectively. We hope you have found this article helpful, if so why not give it a share on your social media?